Hold your breath, make a wish, count to three and visit a world of pure imagination on the silver screen this June as WILLY WONKA & THE CHOCOLATE FACTORY returns to cinemas for two special days, 45 years after it first astonished audiences as part of the Fathom Events and Turner Classic Movies yearlong TCM Big Screen Classics series. Starring Gene Wilder as famed candy man Willy Wonka, the film transformed Roald Dahl’s novel Charlie and the Chocolate Factory into a motion-picture classic with dreamy landscapes, cleverly choreographed musical numbers and indelible performances. This delicious cinematic confection includes all-new commentary from TCM host Ben Mankiewicz both before and after the feature. As the Golden Ticket itself says, “do not be late,” because there will be four screenings only -- two each day, on June 26 and June 29. Follow the five lucky winners of Wonka’s Golden Tickets as they embark on an extraordinary tour of the chocolate factory. There will be little surprises around every corner, but nothing dangerous as Charlie Bucket, Violet Beauregarde, Mike Teevee, Augustus Gloop and Veruca Salt encounter a place where all of their dreams become a reality – and some of their realities become dreams. In addition to Wilder, Willy Wonka & the Chocolate Factory stars Oscar® winner Jack Albertson as Grandpa Joe and, in his only screen appearance, Peter Ostrum as Charlie. Its score by Anthony Newley and Leslie Briscusse includes such essential songs as The Candy Man, Pure Imagination and the Oompa-Loompa songs. 2016 marks 100 years since the birth of Roald Dahl - the author of beloved stories such as Matilda, Charlie and the Chocolate Factory, James and the Giant Peach and The BFG. There will be celebrations for Roald Dahl 100 throughout 2016, delivering a year packed with gloriumptious treats and squiffling surprises for everyone. Visit roalddahl.com/roalddahl100usa for more information. 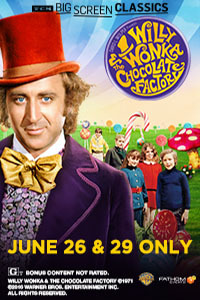 Tickets to TCM Big Screen Classics: WILLY WONKA AND THE CHOCOLATE FACTORY can be purchased online from Fathom Events.